A $20,000 buoy deployed into the waters of Great Pond is expected to answer questions about the lake's ecosystem. Those who see the bright yellow buoy on the surface of the lake near Hoyt’s Island might not realize that it could offer an early warning of blooms in the Belgrade Lakes and other waterways throughout Maine. 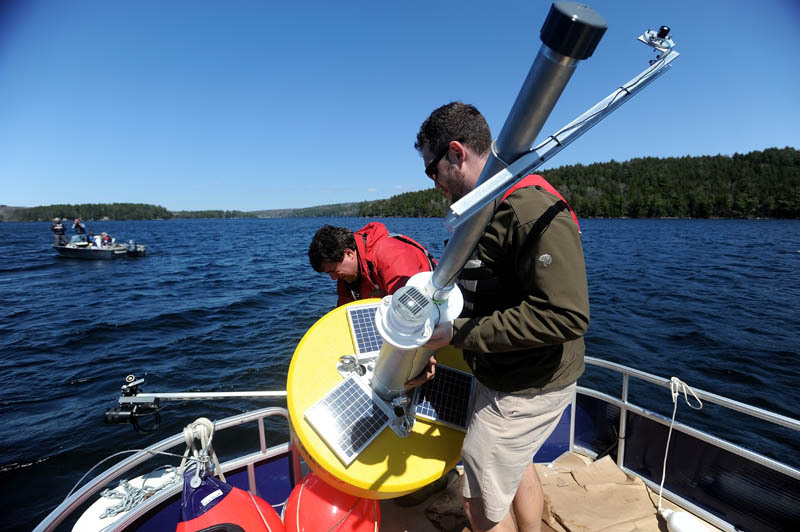 The high-tech buoy will use a variety of solar-powered sensors to collect a rich data stream and wirelessly transmit it to a global network of scientists who will gain a better understanding of the complex natural processes that occur in the lake. Among other things, scientists hope that regular readings on temperature, oxygen levels, light levels and phytoplankton activity will help combat the blooms, which have the potential to undermine seriously the region’s tourist destination value. Blooms happen when lake conditions allow for a population explosion of algae, which can clot the surface of the water with slimy green sheets of organic matter. When the algae die and sink to the bottom of the lake, their decomposition takes so much oxygen out of the water that entire populations of fish can suffocate. Algal blooms have been documented in the seven bodies of water that make up the Belgrade Lakes system since the 1990s, but so far, they have been relatively mild. In East Pond, another lake in the system, East Pond Association President Rob Jones said blooms there have been of short duration and not severe enough to kill fish. Still, he said, they are “at times, aesthetically unpleasant,” and they have been a focus of mitigation efforts by the association for years. Five algal blooms were recorded by the Department of Environmental Protection in Maine in 2012. One was in nearby China Lake, which the department said blooms every year. The other 2012 blooms were found in lakes in Eastbrook, Franklin, Jefferson and Rangeley. On Great Pond, the mild algal blooms have not risen to the standard. A total of 54 lakes in Maine “frequently support algal blooms,” according to the department. Changes in climate can increase the occurrence, severity and impact of harmful algal blooms, according to the National Oceanic and Atmospheric Administration, which in 2004 was officially tasked by the federal government to research the blooms. As the global climate shifts, blooms appear to be increasing — not only in Maine, but in surface waters across the United States, according to the Centers for Disease Control. Large blooms also have a large price tag. In 2005, a form of algal bloom commonly referred to as red tide cost Maine and Massachusetts $23 million in shellfish sales, one of many coastal blooms that cost the United States at least $82 million each year, according to the oceanic administration. It is hard to predict exactly how much money Maine might lose in the face of recurring algal blooms in lakes. A survey conducted by the World Health Organization found that one-third of tourists to coastal destinations would cancel their plans if they knew of an algal bloom in the area. In Kansas, a rash of severe blooms in 2011 caused a revenue drop of about 50 percent at Cheney State Park and turned some previously popular lakeside communities into ghost towns, according to local news reports. The value of the Belgrade Lakes watershed is the subject of another ongoing study by Colby College. Once that study is completed, it may be possible to predict the costs of the blooms, which could help to leverage money to help prevent them. The East Pond Association has been working to convince property owners in the watershed to take measures to prevent phosphorus from leaching into the lakes, because phosphorus can feed and stimulate the growth of algae. On Great Pond in Belgrade on Thursday, the buoy deployment itself went fairly smoothly — two boats full of Colby students and project leaders took the bright yellow buoy, affectionately known as “Goldie the Great Pond Sentinel” out to an agreed-upon point and went about arranging it with its anchors. Fifteen minutes later, the buoy was fully operational. The only casualties were a cut a student suffered on his hand while wrestling the heavy buoy and anchors overboard, and a single screwdriver that inadvertently was dropped into the deepest depths of the pond, estimated at 65 feet. Even before the sensors were dropped into the water, they were transmitting information back to a computer in the Maine Lakes Resource Center. Every fifteen minutes, a new set of data is transmitted, allowing for a detailed tracking of what is happening beneath the lake’s surface. Great Pond is one of about 50 lakes worldwide with such sensor-laden buoys on them. The lakes collectively give scientists in the Global Lake Ecological Observatory Network information that can help to answer questions about global and regional trends. On the local level, Bruesewitz, King and their colleagues can compare data to any observed algal blooms, which will allow for a better prediction and, ultimately, prevention. If scientists understood exactly what conditions created the threshold for a harmful bloom, they could direct resources more effectively to prevent those conditions from happening.